Hop aboard a double-decker bus and enjoy the many sights of Rotterdam, the "Gateway to Europe." 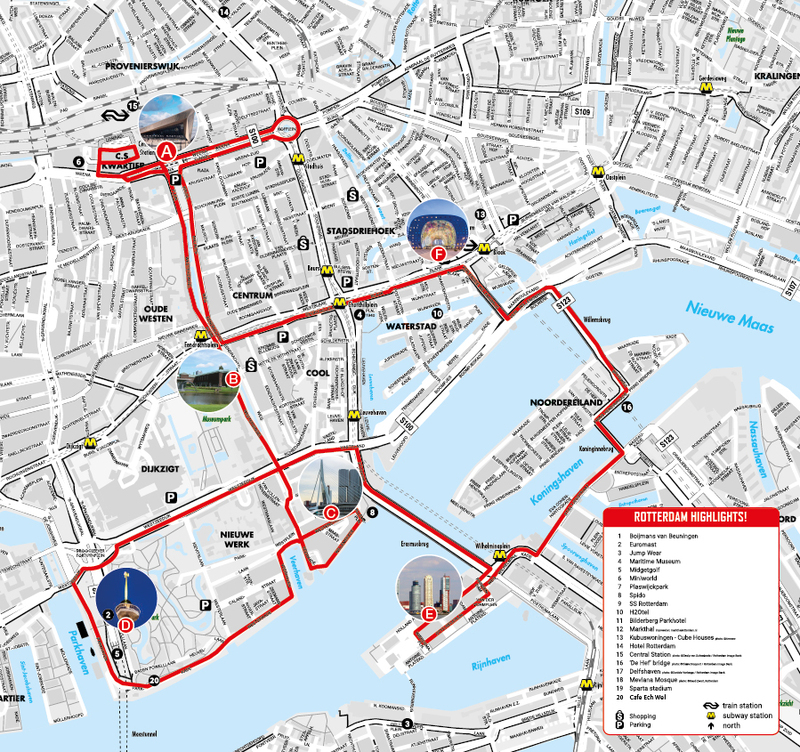 Feel free to hop on and hop off at any of the stops along the Rotterdam bus tour to see as many sights as you want. The sightseeing tour takes you past all the highlights of Rotterdam, including Market Hal, Euromast, Erasmus Bridge, Museum Park, and more. Market Hall is a unique horseshoe-shaped building. It includes office space, residential, and shopping space -- it's an architectural wonder. At the Euromast observation tower, pull out your camera and snap photos of the breahtaking view. Looking for a thrill? You can also rappel down the tower! The Erasmus Bridge is a unique bridge, featuring an asymmetrical white pylon, earning it the nickname "The Swan." More of a culturual buff? Museum Park has several museums, including art museums and a natural history museum. If you are interested in nautical history, Kop van Zuid is where the Holland America Line started in the 19th century. As you can see, there's a lot to do. With the flexible bus system, this Rotterdam bus tour is the ideal way to see the sights of the city at your pace. Please Note: There are 6 stops on this route and it takes approximately 1 hour to complete the route without getting off. The bus runs every 30 minutes. The tours are narrated in English, Dutch, French, German, and Spanish. First and last tour times will be detailed in your electronic ticket. Comfortable lightweight seasonal clothing and walking shoes are recommended. Sweaters or jackets may be needed for the winter months, especially in the evenings. Good quality sunglasses are advised, and photo-chromatic lenses for those who wear spectacles. Guests must be able to get in and out of the bus. This tour is not wheelchair accessible. Excellent tour and organization. This is not an open air bus. The attendant on the bus gave us some very good additional info. Getting the Bus was very easy. We took it all around and then stopped where wanted to go.